A live-aboard community in a picturesque setting in Richmond is facing huge rent hikes, while the harbor’s owners are looking at millions of dollars in upgrades. 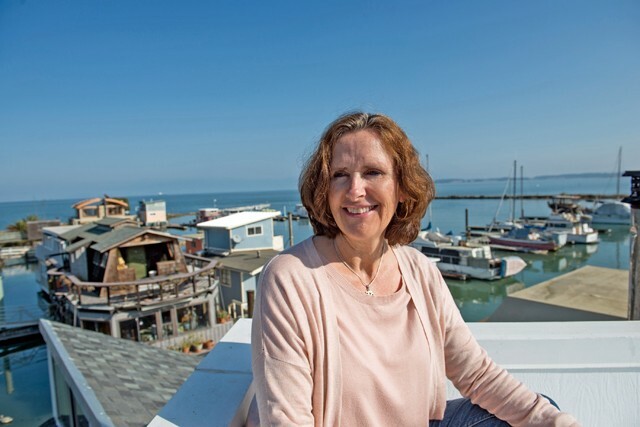 Cindy Laberge is among harbor residents who are negotiating with the new owners for a mutually beneficial outcome. Richmond’s Point San Pablo Yacht Harbor is nestled in a quiet and secluded inlet on the city’s northwestern shore. Beautiful bay vistas and a scenic rugged shoreline surround the small harbor’s 30 or so residents, and a steep, scrub-covered hillside shields them from the outside world. The area’s geography creates an unlikely solitude given the harbor is minutes away from a major commuter bridge, the largest city in the county, and the highest producing oil refinery on the West Coast. The 80-year-old harbor hosts a collection of houseboats, sailboats, a Chinese junk, and 10 floating homes that look like an eclectic group of modest dwellings one might find in a working-class neighborhood. But the harbor also has the feel of a smuggler’s hidden cove from a novel by Ernest Hemingway or Raymond Chandler. In fact, it was the location for the 1955 movie Blood Alley starring John Wayne and Lauren Bacall. But since new owners purchased the harbor and 15 acres of uplands a year ago, the solitude has been disrupted by a gnawing tension, uncertainty caused by rent hikes, policies that lower floating home values, and the constant threat of the harbor’s closure. The live-aboard boat community has a long tradition on the San Francisco Bay that goes back to the 1800s, and for the 30 or so residents at San Pablo Yacht Harbor, it could be the end of a lifestyle that has been disappearing from the Bay Area shoreline. The residents of the harbor include a yoga instructor, auto mechanic, carpenter, caterer, and horse trainer. And some of them are in their 60s and 70s and on fixed incomes. The focus of the dispute is the cost to upgrade the harbor’s infrastructure, including a crumbling roadway that is the sole access to the site. Despite its bucolic setting, the harbor needs millions of dollars in upgrades to be code compliant with the notoriously persnickety waterfront regulatory agencies. Shortly after the partners purchased the property, the reality of decades of deferred maintenance quickly wore off some of the magic. The jetties, which were originally formed from the sunken hulls of 19th century schooners, would have to be reinforced and the entire harbor upgraded to accommodate a potential sea level rise of 5 feet in the decades ahead. The cost to bring the harbor up to code is easily $10 million and maybe as much as $15 million, according to Wright. Harbor residents estimate the cost to be between $3 and $5 million. In addition, no work can be done until the Bay Conservation and Development Commission renews the harbor’s operating permit, and because of the waterfront location, as many as 13 agencies will have to sign off on any upgrades to the property. The commission is a notorious stickler over building and upgrade plans. It’s a part of the harbor’s lore that the former harbor owner lunged across a table at one BCDC commissioner who suggested the owner fund a public park at the site. Not long after buying the harbor, Wright and his partners sought to cover their overhead by asking the nine floating homeowners for a one-time payment of $100,000 for harbor upgrades under the threat of drastically raising their monthly slip rents from $700, the average rental charge at other Bay Area floating home harbors, to $2,000—a hike of more than 185 percent. In exchange for the $100,000, floating home residents would receive five-year leases with an option to renew for another five. Long leases are critical to floating homeowners because they have a direct effect on property values. Without a predictable lease, it’s hard to find a mortgage, and floating home values can plummet by as much as $100,000, according to one floating homeowner. In an interview, Wright admitted that he and the other new owners caused unnecessary anxiety when they asked the floating homeowners for $100,000 each in January. Later, they backed off their demand for a $100,000 “buy in” for new leases. In June, the new landlords presented slip renters with a new rental agreement that added higher rents for some boats, higher garbage fees, and new charges for parking and overnight guests. They also asked residents for $2,000 to purchase new firefighting equipment, which the landlord is typically responsible for. Eventually, the two sides reached a deal in which harbor residents would remain monthly tenants with a rental increase of $69, or just under 10 percent. But on Nov. 11, the landlords gave the floating home residents more bad news. Anybody who purchases a floating home in the future will pay $1,500 slip rent. That means new owners will pay $18,000 a year in addition to a mortgage, property taxes, and the landlords’ new fees. The monthly rent is also much higher than what other floating home harbors charge. In Sausalito’s Marina West Marina where the docks, roadways, and infrastructure are well-maintained, slip rent for floating homes average $980 per month and the marina owners offer long-term leases. At Barnhill Harbor in Alameda, slip rents are under $700. Three members of the harbor’s homeowners’ association have been negotiating with the new owners over new leases and the going has been tough. Association member Cindy Laberge said that any progress that’s been made is usually wiped out by hostile emails that suggest the owners are not going to budge on their position. Laberge said she’s hopeful because the new owners do not fall neatly into the category of greedy landlords. According to their plans for the property, it’s clear they are less interested in maximizing profit margins than in creating an interesting environment that draws people for an experience with nature and culture. Wright’s other endeavor, Bridge Art Space, is a unique business model that has been economically successful while offering Richmond artists much-needed work studios and a place to exhibit their work. This story was originally published by our sister publication, The East Bay Monthly. After being forced to evict its tenants after the Ghost Ship fire, the Richmond mixed-use space decided to switch to a co-working model.